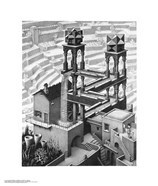 Maurits Cornelis Escher was born in Leeuwarden, 17 June 1898. He received his first instruction in drawing at the secondary school in Arnhem, by F.W. van der Haagen, who helped him to develop his graphic aptitude by teaching in the technique of the linoleum cut. 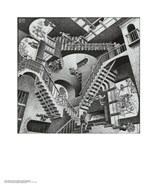 From 1919 to 1922 he studied at the School of Architecture and Ornamental Design in Haarlem, where he was instructed in the graphic techniques by S. Jessurun de Mesquita, whose strong personality greatly influenced escher's further development, as graphic artist. In 1922 he went to Italy and 1924 settled in Rome. During his 10 year stay in Italy he made many study-tours, visiting Abruzzia, the Amalfi coast, Calabria, Sicily, Corsica and Spain. In 1934 he left Italy, spent two years in Switzerland and five years in Brussels before settling in Baarn, Holland in 1941, where he died on 27 March 1972, at the age of 73 years.